Oh yes, the other FO that I promised to show you all...high five! Surprisingly, this is not a Veera Välimäki design. Not even a Jane Richmond one either. This lovely number was knit from a Gudrun Johnston pattern, and I must say, girlfriend knows how to write a very thorough pattern! I know I've said this in the past about a bunch of patterns, but seriously, this pattern is so beyond extremely well-written that the designer has thought out absolutely every single detail out for you! From stitch counts to how many stitches you need to pick up around the armhole...I was pleasantly and wonderfully surprised that I had hit every number right on the dot. And for me, that's a rare thing. I really have nothing bad to say about this pattern and knitting it up was a breeze. Except for the twisted ribbing. As lovely as twisted ribbing is, I am SO not a fan of knitting it. I should have known this eons ago when I had knit my Sweet Monkey socks. If I didn't like knitting it on the cuff of socks, why did I think I would enjoy knitting twelve inches of it on a cardigan?? But if truth be told I don't think regular ol' ribbing would have had the same effect on this design, and to save my sanity I had only knit 9" altogether of the twisted rib - 3" each on the hem and sleeve cuffs. I thought the full 4" would be too much on me and make my short frame look even shorter. I'm still not a fan of how short/cropped I had made this. It's definitely the shortest of all the other cardigans I have ever made and am so glad that blocking has made it somewhat longer. I had contemplated cutting off the cast on at the hem, unravelling all that ribbing, knit a few inches onto the body and re-knit the ribbing. But then I thought about having to re-knit all that twisted ribbing and decided against this idea. If it really bugs me that much I'll consider the idea again in the future. In the meantime I'll just have to wear this cardigan with either dresses or high-waisted skirts and pants. One of the main reasons why I didn't knit the length longer was because I didn't think I would have enough yarn to do so. Well...let me tell you how dead wrong I am! I had bought three skeins of SweetGeorgia Yarns Merino Silk Fine knowing full well that I was going to use it to knit this pattern. No other pattern came to mind whenever I saw the yarn. It was the perfect combo. Nothing in this universe was going to separate them. So those three skeins gave me 1140 yards to knit this bad boy up. In hindsight this was way more yardage than needed for my size, but whilst knitting I didn't think so. In the end I had only used up 2 of the 3 skeins with about 10 grams of the third. For those of you doing the math, I had used almost 800 yards to knit this sweet little cardi up. Seems like a really small amount, doesn't it? I thought so. And I really didn't think this was going to fit me in the end and I could feel the disappointment slowly starting to rise in me. I did try the cardigan on throughout the knitting process, but kept thinking that the button bands will add a little to the width and hopefully it'll stretch a little in length over time. I had even taken the cardigan (pre-blocked) to one of my knit nights, more to ask the ladies for their opinions on buttons, but ended up trying it on for them. I could see it in their faces. The cardigan looked a bit on the small side. So mix together the snug fit and the bright pink, I have to say that I kinda felt like I was wearing a school girl's sweater. But hallelujah! Thank you blocking magic! Not only have you have restored my faith in why I like to knit solely with natural fibres but you have also restored my love for this project! I had blocked this project in my hotel room while I was in quarantine and was so surprised that it had dried over night. I wasn't overly aggressive in the blocking, just at the yoke. The silk content of the yarn did all the stretching for me. I had totally forgot how much silk likes to grow and am hoping that the equal amount of wool will help the cardigan to "remember" to keep its shape. But how happy was I that this cardigan grew enough to fit just right?? Well, I think it could still be longer in length. Oh well. I had a hard time finding buttons for this project too. Why is it always so hard to find just the right buttons at just the right size? I had carried the cardigan with me every time I went shopping, just in case I came across anything that sold buttons. I tried to find buttons that would match the colour perfectly. Which I did find. 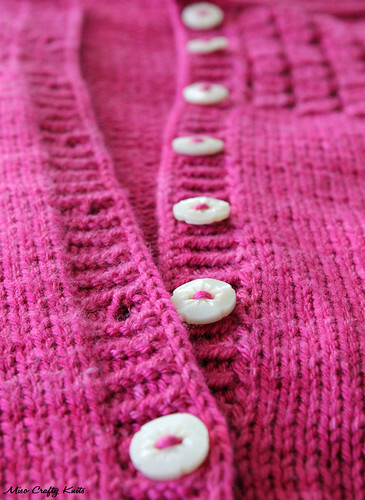 Sadly those buttons were 3 mm too big and made the cardigan look sloppy and somehow, less girly. I didn't think that was possible with something so pink! After a week of searching with no luck, Brett took the Munchkin off my hands and I was able to go to "the button shop". Thanks to the lovely ladies in my knitting group I had an idea of what to look for, and with the help of the owners I was able to find the perfect buttons! No, they don't match in colour but I think they add to the girly, vintage-y feel of the cardigan. I think they are much better than my original plan. Even though I think this pattern is pretty much perfect, I had made two modifications: the aforementioned shortening of the twisted ribbing at the hem and sleeve cuffs (and replacing it with regular ol' stockinette to keep the length); and instead of using a purl stitch to make a fake side seam I used the Elizabeth Zimmermann method that uses a crochet hook (I looked at the Purl Bee post about it here - scroll to the very bottom) to help combat future droopiness that the silk might cause over time. Ok, now to plan out some outfits to wear with this cardigan...and to figure out what to do with that third skein! Thanks Leah! I actually can't wait for when the weather gets a little warmer so that I can pair this cardi up with some cute skirts and dresses! Yet after a quick look in my closet, I think I'm going to need to either go on a major shopping spree or sewing spree! I have nothing worthy to wear with this cardigan! This looks amazing on you, it turned out perfectly and I love the colour choice, it suits this cardigan so well (and the buttons are fab!). This has been in my queue forever and you just about pushed me over the edge! Thanks Jane! This pattern was in my queue forever too...I'm glad that I decided to just do it and stop procrastinating on it! whoa. is that the perfect pink or what? Wow. I'm (almost) speechless. This sweater is the bomb. While it may feel too short to you, from this end it looks just perfect: the colour, the length, the fit, the buttons - it's perfection! I think once I wear it with the right outfit I'll like the length more. I think I see some sewing projects in the very near future! Thank you so much Felicia!!! So, so cute. I love the color, and it looks like it will be the perfect length to wear with high-waisted skirts. I also love your tattoo!